Lagos State Governor, Mr. Akinwunmi Ambode (middle); Commissioner, Legal, Licensing, Compliance Division, Nigerian Electricity Regulatory Commission (NERC), Mr. Dafe Akpeneye (3rd right); Commissioner for Energy & Mineral Resources, Mr. Olawale Oluwo (right); Officials of NERC and Lagos State Government during a meeting with NERC on the Lagos Embedded Power Programme in Abuja, on Friday, August 4, 2017. 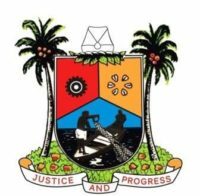 Lagos State Governor, Mr. Akinwunmi Ambode, on Friday sought a no objection letter from the Nigerian Electricity Regulatory Commission (NERC) for the State Government’s Embedded Power Programme. 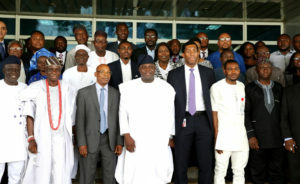 Governor Ambode, who led some members of the State Executive Council, lawmakers and other critical stakeholders to a meeting at the NERC’s headquarters in Abuja, said the embedded power project was designed as his administration’s flagship programme for direct intervention in the power value chain towards achieving a 24-hour power for Lagos. He said the proposed power programme would generate up to 3,000MW of power through accelerated deployment of various power plants in strategic locations across the State by private sector power providers within three to six years. He noted that Nigerians’ aspiration to create a secured and prosperous nation that is globally competitive will be difficult to achieve without stable power supply. Governor Ambode posited that while efforts are ongoing to resolve the power crisis, it had become increasingly clear that the problems in the energy sector could no longer be left to the Federal Government alone to solve. “Embedded power was designed as our flagship programme for direct intervention in the power value chain towards achieving a 24-hour power for Lagos. Lagos State has always demonstrated its capacity and willingness to play a leading role in resolving the power sector challenges in the state, subject to the limit of the federal authority allowed regulations. “The stakeholders meeting holding today is a continuation of the ongoing engagement between NERC and the Lagos State Government on the Lagos State Embedded Power Programme. “We are convinced that the offer by our government to deploy the state’s balance sheet in support of power generation, transmission, distribution, gas supply, metering, collection and enforcement in Lagos State will significantly relieve the national grid and free more energy for distribution to other parts of Nigeria. He said the State Government would issue guarantees in support of the Power Purchase Agreements that will be signed between the distribution companies and the private sector embedded power providers to enhance bankability of the projects. He added that the power generated under the programme will be distributed through the networks of Eko and Ikeja Distribution Companies while the state would support the distribution companies in upgrading their distribution infrastructure for embedded power areas in line with NERC guidelines. “The State Government will support the distribution companies in installation of smart prepaid meters in the areas where embedded power is deployed. We will institute a cost-reflective tariff regime that is fair to all stakeholders, sustainable and capable of attracting private capital to the sector on a continuous basis. “Other areas of collaboration include support for revenue collection, legislation and establishment of an agency for enforcement of power theft laws in Lagos. “Our prayer today is to seek the commission’s no objection letter for the Lagos State Embedded Power Programme, based on cost reflective tariff regime that is fair to all parties and capable of unlocking private sector investments into the power sector on a sustainable basis,” the Governor said. Responding, the NERC’s Commissioner in charge of Legal License and Compliance, Dafe Akpeneye, who stood in for the Commission’s Vice Chairman, promised that the NERC would work with the Lagos State Government to ensure the success of the programme. “Within the ambit of the law and existing regulations, you have our unflinching support in this project. “As the laws and regulations permit us, we will work with you on this project to ensure that it does see the light of the day,” Akpaneye promised. Akpeneye however called the Governor’s attention to some safety issues that concern the state. He spoke about the right of way, standards and designs, electricity theft as well as customers’ enumeration. He noted that a situation where the Commission’s record indicates that there are only 1.2million registered electricity customers in Lagos State is not tidy enough when almost all the houses in the state are connected to national grid. Representatives of both Eko and Ikeja Distribution Companies at the meeting declared their support for the project, saying that it would be detrimental to the progress of Nigeria if they opposed it.